Electhium Lithium battery replacing the OEM reference Yuasa for weight gain (about 1.5 kg!) on the bike. Also makes starting easier. 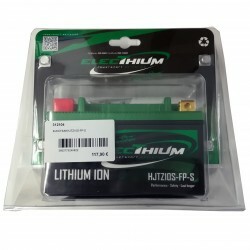 Attention, needs a lithium dedicated charger to (re)load. 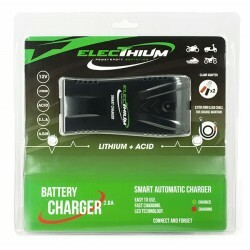 Smart charger that works with all types of batteries (lithium / gel / acid). The charge is adapted according to the type of battery to optimize its power and its life.